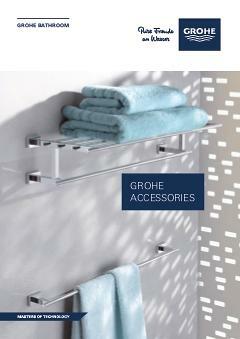 The GROHE Essentials Authentic towel rail can accommodate towels of up to 600 mm width. Its classic design is functional and appealing at the same time and, finished with a chrome coating, it comes with an elegant glossy shine. Looking for matching accessories to go with a classic tap style? Crafted with their sweeping lines and smooth curves, the GROHE Essentials Authentic accessories are a perfect match for the nature-inspired design of our Parkfield range. This range is available in our GROHE StarLight® chrome coating for a striking diamond sheen or in brushed nickel with an elegant mat finish.